Shahn was born in Kovno (Kaunas), Lithuania, then occupied by the Russian Empire, to Jewish parents Joshua Hessel and Gittel (Lieberman) Shahn. His father was exiled to Siberia for possible revolutionary activities in 1902, at which point Shahn, his mother, and two younger siblings moved to Vilkomir (Ukmergė). In 1906, the family immigrated to the United States where they rejoined Hessel, who had fled Siberia. They settled in the Williamsburg section of Brooklyn, New York, where two more siblings were born. His younger brother drowned at age 17. Shahn began his path to becoming an artist in New York, where he was first trained as a lithographer. Shahn's early experiences with lithography and graphic design is apparent in his later prints and paintings which often include the combination of text and image. Shahn's primary medium was egg tempera, popular among social realists. 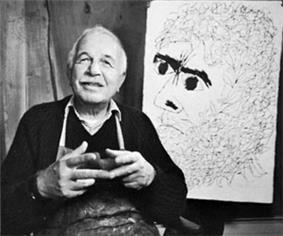 Although Shahn attended Pablo Picasso and Paul Klee. Contemporaries who would make a profound impact on Shahn's work and career include artists Walker Evans, Diego Rivera and Jean Charlot. Shahn was dissatisfied with the work inspired by his travels, claiming that the pieces were unoriginal. Shahn eventually outgrew his pursuit of European modern art; he, instead, redirected his efforts toward a realist style which he used to contribute to social dialogue. The twenty-three gouache paintings of the trials of Sacco and Vanzetti communicated the political concerns of his time, rejecting academic prescriptions for subject matter. The Passion of Sacco and Vanzetti was exhibited in 1932 and received acclaim from both the public and critics. This series gave Shahn the confidence to cultivate his personal style, regardless of society’s art standards. Photograph of a sailor taken by Shahn in Jackson Square, New Orleans, 1935. Shahn's subsequent series of California labor leader Tom Mooney won him the recognition of Diego Rivera. In May and June 1933, he served as an assistant to Diego Rivera while Rivera executed the Rockefeller Center mural. Shahn had a role in fanning the controversy, by circulating a petition among the workers. Also during this period, Shahn met photojournalist Bernarda Bryson, who would later become his second wife. Although this marriage was successful, the mural, his 1934 project for the Public Works of Art Projects and proposal for the Municipal Art Commission were all failures. Fortunately, in 1935, Shahn was recommended by Walker Evans, a friend and former roommate, to Roy Stryker to join the photographic group at the Farm Security Administration (FSA). As a member of the FSA group, Shahn roamed and documented the American south together with his colleagues Walker Evans and Dorothea Lange. 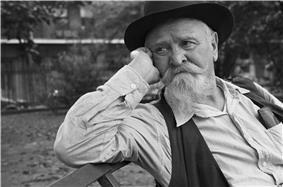 Like his earlier photography of New York City, Shahn’s FSA work can be viewed as social-documentary. Similarly, Shahn’s New Deal art for the FSA and Resettlement Agency exposed American living and working conditions. He also worked for these agencies as a graphic artist and painter. Shahn’s fresco mural for the community center of Jersey Homesteads is among his most famous works, but the government also hired Shahn to execute the Bronx Central Annex Post Office and Social Security murals. In 1939, Shahn and his wife produced a set of 13 murals inspired by Walt Whitman's poem I See America Working and installed at the United States Post Office-Bronx Central Annex. Curator Susan Edwards recognizes the influence of this art on the public consciousness, writing, "The Roosevelt administration believed [such] images were useful for persuading not only voters but members of Congress to support federal relief and recovery programs… The art he made for the federal government affirms both his own legacy and that of the New Deal." During the war years of 1942-43, Shahn worked for the Office of War Information (OWI), but his pieces lacked the preferred patriotism of the day and only two of his posters were published. His art's anti-war sentiment found other forms of expression in a series of paintings from 1944–45, such as Death on the Beach, which depicts the desolation and loneliness of war. In 1945 he painted Liberation about the Liberation of Paris which depicts children playing in the rubble He also did a series, called Lucky Dragon, about the Daigo Fukuryū Maru (literally, Lucky Dragon No. 5), the Japanese fishing boat caught in the Bikini Atoll hydrogen bomb blast. As of 2012, an important part of this series is in the collections of Fukushima Prefectural Museum of Art. From 1961 to 1967, Shahn worked on the stained glass at Temple Beth Zion, a Buffalo, NY synagogue designed by Harrison and Abramovitz. 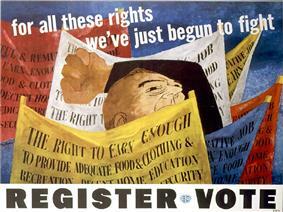 Shahn also began to act as a commercial artist for CBS, Time, Fortune and Harper's. His well-known 1965 portrait of Martin Luther King, Jr. appeared on the cover of Time. Despite Shahn's growing popularity, he only accepted commissions which he felt were of personal or social value. By the mid-1950s, Shahn's accomplishments had reached such a height that he was sent, along with Willem de Kooning, to represent the United States at the 1954 Venice Biennale. He was also elected to the American Academy of Arts and Sciences, the National Institute of Arts and Letters and the Academia dell' Arte e del Disegno in Florence. The Art Directors Club Hall of Fame recognizes him as "one of the greatest masters of the twentieth century. Honors, books, and gallery retrospectives continue to rekindle interest in his work...years after his death." The artist was especially active as an academic in the last two decades of his life. He received honorary doctorates from Princeton University and Harvard University, and joined Harvard as a Charles Eliot Norton professor in 1956. His published writings, including The Biography of Painting (1956) and The Shape of Content (1960), became influential works in the art world. After his death, William Schuman composed "In Praise of Shahn", a modern canticle for orchestra, first performed January 29, 1970, by the New York Philharmonic, Leonard Bernstein conducting. Ben Shahn’s social-realist vision informed his approach to art. Shahn’s examination of the status quo inspired his creative process. Although he often explored polemic themes of modern urban life, organized labor, immigration and injustice, he did so while maintaining a compassionate tone. Shahn identified himself as a communicative artist. He challenged the esoteric pretensions of art, which he believed disconnect artists and their work from the public. As an alternative, he proposed an intimate and mutually beneficial relationship between artist and audience. Shahn defended his choice to employ pictorial realities, rather than abstract forms. According to Shahn, known forms allow the artist "to discover new truths about man and to reaffirm that his life is significant." References to allegory, the Jewish bible, humanistic content, childhood, science, music and the commonplace are other motifs Shahn draws upon to make the universal personal for his viewers. Wit, candor and sentimentality give his images poignancy. By evoking dynamism, Shahn intended to inspire social change. Shahn stressed that in art, as in life, the combination of opposing orders is vital for progress. His hope for a unity among the diverse peoples of the United States relates to his interest in fusing different visual vocabularies. Shahn mixed different genres of art. His body of art is distinctive for its lack of traditional landscapes, still lifes, and portraits. Shahn used both expressive and precise visual languages, which he coalesced through the consistency of his authoritative line. His background in lithography contributed to his detail-oriented look  Shahn is also noted for his use of unique symbolism, which is often compared to the imagery in Paul Klee's drawings. While Shahn's "love for exactitude" is apparent in his graphics, so too is his creativity. In fact, many of his paintings are inventive adaptations of his photography. Evocative juxtapositions characterize his aesthetic. He intentionally paired contrasting scales, colors, and images together to create tension. One signature example is seen in his play between industrial coolness and sympathetic portrayals. Handball demonstrates his "use of architectural settings as both psychological foil to human figures and as expressive abstract pattern." His art is striking but also introspective. He often captured figures engrossed in their own worlds. Many of his photographs were taken spontaneously, without the subject's notice. Although he used many mediums, his pieces are consistently thoughtful and playful. The Farm Security Administration commissioned Ben Shahn to paint a mural for the community center of Jersey Homesteads (later renamed Roosevelt), a New Jersey town initially planned to be a community for Jewish garment workers. Shahn's move to the settlement demonstrates his dedication to the project as does his mural's compelling depiction of the town's founding. Three panels compose the mural. According to art historian Diana L. Linden, the panels' sequence relates to that of the Haggadah, the Jewish Passover Seder text which follows a narrative of slavery, deliverance and redemption. More specifically, Shahn’s mural depicts immigrants' struggle and advancement in the United States. The first panel shows the antisemitic and xenophobic obstacles American immigrants faced. During the global Depression, citizens of the United States struggled for their livelihoods. Because foreigners represented competition for employment, they were especially unwelcome. National immigration quotas also reflected the strained foreign relations of the United States at a time when fascism, Nazism, and communism were on the rise. To illustrate the political and social adversary, Shahn incorporated loaded iconography: Nazi soldiers, anti-Jewish signs and the executed Italian anarchists, Sacco and Vanzetti. Below, Shahn's mother and Albert Einstein lead immigrants on a gangplank situated by the Ellis Island registry center and the Statue of Liberty. This section demonstrates the immigrants' heroic emergence in the United States. The middle panel describes the poor living conditions awaiting immigrants after their arrival. On the right, Shahn depicts the inhuman labor situation in the form of "lightless sweatshops...tedious and backbreaking work with outmoded tools." The crowd in the center of the composition represents labor unions and workers' reform efforts. Here, a figure resembling labor leader John L. Lewis protests in front of the Triangle Shirtwaist Company, where a devastating fire occurred and the movement for the International Ladies' Garment Workers Union (ILGWU) began. The lower right passageway marked ILGWU symbolizes a new and hopeful path, in the United States, paved by unionized labor. In the last panel, the unions and the New Deal unite to create the blueprint for the town of the Jersey Homesteads. Various figures of social progress such as Sidney Hillman and Heywood Broun gather around the drafting table. Above them are images of the purposed cooperative farm and factory along with a campaign poster of Roosevelt, after whom the town was eventually named. The arriccio, sinopia drawings of the fresco for Ben Shahn's Jersey Homesteads Mural, was removed from its original community center location in Roosevelt, NJ and is now permanently installed in a custom-designed gallery on the second floor of the US Post Office building at 401 Market St, Camden, NJ. This gallery adjoins the neighboring Mitchell H. Cohen Building and U.S. Courthouse (4th and Cooper Streets). Shahn’s biographer Soby notes "the composition of the mural at Roosevelt follows the undulant principle Shahn had learned from Diego Rivera: deep recession of space alternating with human and architectural details projected forward." Moreover, the montage effectively intimates the amalgamation of peoples and cultures populating the urban landscape in the early 20th century. Multiple layers and perspectives fuse together to portray a complex industrialized system. Still, the mural maintains a sense of humanity; Shahn gives his figures a monumental quality through volume and scale. The urban architecture does not dwarf the people; instead, they work with the surroundings to build their own structure. Shahn captured the urgency for activism and reform, by showing gestures and mid-steps and freezing all the subjects in motion. This pictorial incorporation of "athletic pose and evocative asymmetry of architectural detail" is a Shahn trademark. While exemplifying his visual and social concerns, the mural characterizes the general issues of Shahn's milieu. Age of Anxiety, 1953, The Joseph H. Hirschhorn Foundation, Inc.
"Ben Shahn," 1962, Palais des Beaux-Arts in Brussels, Belgium; Galleria Nazionale D'arte Moderna in Rome, Italy; and Albertina in Vienna, Austria. "The Collected Prints of Ben Shahn," 1969, Philadelphia Museum of Art in Pennsylvania. "Ben Shahn: A Retrospective Exhibition," 1969, New Jersey State Museum, Trenton, New Jersey. "Ben Shahn's New York: The Photography of Modern Times," 2000-2001, Fogg Art Museum, Cambridge, Massachusetts. ^ Berger, Maurice. New York." Jewish Museum (New York), 2004. ^ a b c d e f g h i j Morse, John (1972). Ben Shahn. New York: Praeger Publishers Inc.
^ a b c Kao, Deborah. Ben Shahn's New York: The Photographs of Modern Times." Harvard University Art Museums, February 2000. ^ a b c d Prescott, Kenneth (1973). The Complete Graphic Works of Ben Shahn. New York: Quadrangle. ^ Donald J. Framberger, Joan R. Olshansky, and Elizabeth Spencer-Ralph (September 1979). "National Register of Historic Places Registration: Bronx Central Annex-U.S. Post Office". ^ Edwards, Susan (September 1999). Ben Shahn's New Deal: The Resettlement Administration (RA) and the Farm Security Administration (FSA). Harvard University Art Museums. ^ a b c "Ben Shahn: Passion for Justice". PBS. 2002. Retrieved 18 March 2008. ^ a b Takao Yamada (2012-01-23). "The paintings that won't reach Fukushima". Mainichi Daily News. Retrieved 2012-01-28. ^ "1988 Hall of Fame: Ben Shahn". The Art Directors Club. 2007. Retrieved 18 March 2008. ^ a b c d e f Soby, James Thrall (1947). The Penguin Modern Painters: Ben Shahn. West Drayton: Penguin Books Limited. ^ Shahn, Ben (1966). The Biography of Painting. New York. Paragraphic Books. ^ a b c d e f g Soby, James Thrall (1963). Ben Shahn Paintings. New York: George Braziller Inc.
"1988 Hall of Fame: Ben Shahn". The Art Directors Club. 2007. Retrieved 18 March 2008. "Ben Shahn: Passion for Justice". PBS. 2002. Retrieved 18 March 2008. Chevlowe, Susan (1998). Common Man Mythic Vision: The Paintings of Ben Shahn. Princeton: Princeton University Press. Edwards, Susan (September 1999). Ben Shahn's New Deal: The Resettlement Administration (RA) and the Farm Security Administration (FSA). Harvard University Art Museums. Morse, John (1972). Ben Shahn. New York: Praeger Publishers Inc.
Pohl, Frances (1993). Ben Shanh. Chesterfield: Chameleon Books Inc.
Prescott, Kenneth (1973). The Complete Graphic Works of Ben Shahn. New York: Quadrangle. Shahn, Ben (1966). The Biography of Painting. New York. Paragraphic Books. Shahn, Ben (1957). The Shape of Content. Cambridge: Harvard University Press. Soby, James Thrall (1963). Ben Shahn Paintings. New York: George Braziller Inc.
Soby, James Thrall (1957). Ben Shahn: His Graphic Art. Soby, James Thrall (1947). The Penguin Modern Painters: Ben Shahn. West Drayton: Penguin Books Limited.